Paintless Dent Repair (PDR) was first developed on the Mercedes Benz factory lines during the late 1940’s. The method was then perfected and was introduced to the general market in the early 1980’s. Auto Dents specializes in PDR. We have been Oklahoma owned and operated since 1989 and back up our work with a limited lifetime warranty. Auto Dents offers superior hail damage repair to assure the highest standards for our customers. Please explore our site to learn more about the service we provide. Feel free to call or email us with any questions. We look forward to hearing from you! 1. Call your insurance company. 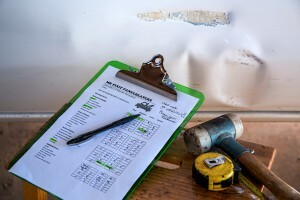 They will require that a claims adjuster examine your vehicle before you will be allowed to do anything. 2. Find a reputable shop. Check their business references. Ask questions. 4. Call us. Even if you don’t select us to repair your vehicle, we can help educate you about the repair process. 5. If you like our work, tell your friends. 6. If you don’t like our work, tell us. We welcome feedback and constantly look for ways to improve.